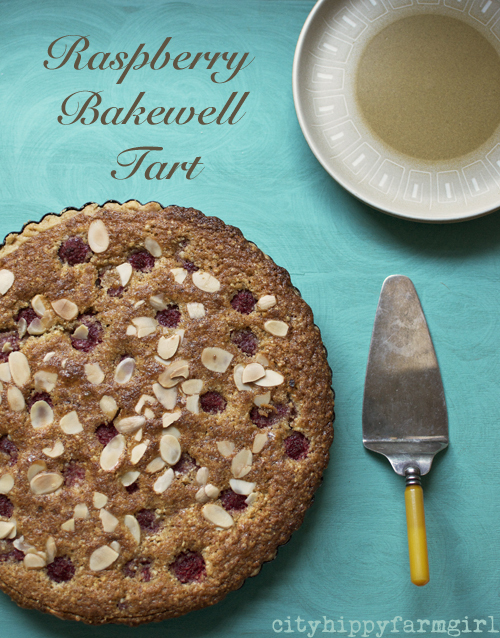 This entry was posted in Food Glorious Food and tagged bakewell tart, berries, bitter almond aroma, dessert, raspberries, recipe, seasonal by cityhippyfarmgirl. Bookmark the permalink. I’m having a similar conversation with myself today… “Pumpkin and Kale risotto would be good for dinner, I love risotto, the baby loves risotto, but hubby doesn’t. Maybe I shouldn’t make again for a while. Maybe… Nahhh, baby wins!” He’ll eat the risotto, and might even enjoy it, but he’ll complain every time! Good to hear I’m not the only one having conversations with myself Sam. As for risotto? Always a winner I say! At the moment, with it just me and Mr B, I confess to taking the “all to myself” route quite often 😉 I do tend to make slightly smaller versions of goods, but nonetheless…it is probable that any future children would have a good effect on my sharing and also my baked good intake! For the record, though, I love bitter almond and also adore bakewell tart. All.the.time. 🙂 Mostly with chilli, although anything vegetarian (the bear likes meat with just about every meal omg whereas the kids and I don’t)…oh it’s impossible to please everyone, or nearly. It depends upon my mood as to whether I cook to please myself or the family…I don’t have any idea what bitter almond aroma is! Think Amaretto Sara. If you like the smell and taste of that delicious drink of the gods…well then you’ll love the stuff. It’s divisional though, its seems you either love it or hate it- also helps if you like marzipan. Hmmm! I know what you mean now. It looks beautiful, and I love bitter almonds! That would be a tough one – leave in, or not; share, or not; I think I’d to and fro a bit as well! We have a variety of food preferences at our house so I’m often balancing what I would prefer with what others will eat…Chilli is an issue, also fish, eggs, capsicum…quite a few things now I think about it! I also love your wonderful old cake slice! I have one I bought at a second hand shop and it just feels great in your hand. I love that little server as well. I had been after one for years, but the right one never came up. My dad then found me this one and I love it to bits. Looks like a delicious tart to me! 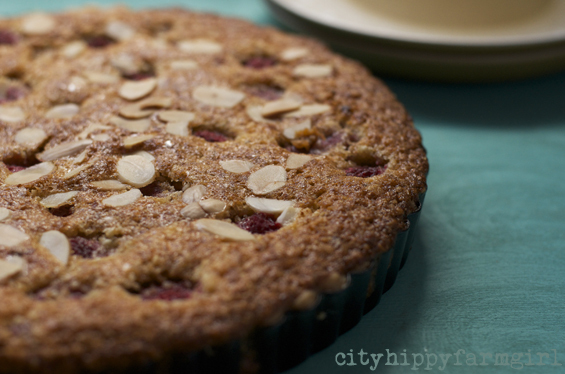 The tart came out beautifully but may I suggest for next time that you make two littler ones. One for the rest of them to share, and one just for you. That’ll show them! If I wasn’t such a lazy baker Stacy I would say that’s a cracking idea….The Lazy Baker, a definite alternative blog name! How do they know they still don’t like it if they don’t keep trying? I think you owe it to everybody to add bitter almond aroma every now and then, for their own good and then one day, when there’s nothing else to eat in the house they may decide it isn’t too bad. Rather like the strawberry cream in the chocolate box – nobody wants it until it’s the only flavour left and then somehow it’s quite desirable. It looks a delicious tart. Strawberry Cream is a bit like that isn’t it…now I wonder why? It’s always the bottom of the barrel in my book. Having your own raspberries is indeed a marvelous thing. Whenever they decide to pop up their red little heads, maybe they be bountiful and delicious! I say if the cook is called to cook then thats all that matters. Another beautiful morsel you’ve dished up Brydie. Sometimes I definitely give in to that dilemma Brydie! My reasoning being that I have a lot fewer options than the rest of them, so sometimes I just need to get my way 🙂 Your tart certainly looks scrummy indeed, and I’m sure we’d all agree on that!